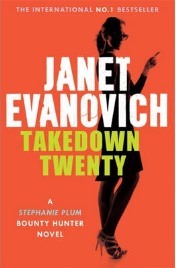 When the chance to read Janet Evanovich’s latest Stephanie Plum novel, Takedown Twenty, arose I was first in line shouting “Me, me, me” in an entirely undignified way because Stephanie is an old friend of mine. It couldn’t be any other way after I’ve read 18 books about her and her hapless attempts to bring in the bad guys as a bail bond enforcer for her cousin Vinnie in the New Jersey town of Trenton. I’ve been with her since the very beginning back in 1994 – I have a signed copy of ‘One for the Money’ – and up to now, have missed only one, and that’s purely because I’ve not got round to tracking down a copy. As someone who spends most of her time on non-fiction or rather more ‘literary’ fiction, I love to step off my high-brow high-ground and have some fun with my favourite law and order girl. Janet Evanovich, the prolific author of the popular Stephanie Plum series has struck again. 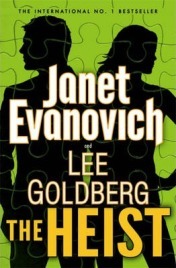 Not satisfied with producing the twentieth book in the Plum series this year, she has now teamed up with Monk screenwriter Lee Goldberg to start a new series featuring FBI Special Agent Kate O’Hare and international con artist Nick Fox, starting with this book, The Heist. 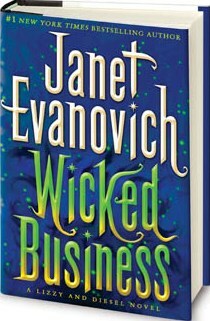 I had previously only read one Evanovich book, Wicked Business (part of her Lizzy and Diesel series) and found it to be gently amusing, but too maddeningly insubstantial to really lose myself in the story. Although a bit disappointed, I thought at the time that I should probably give her books another go, and the start of a new series seemed the perfect place to do so. For centuries, adventurers and power seekers have sought to possess the seven SALIGIA stones, mystical objects created by an unknown source and said to each represent one of the seven deadly sins (SALIGIA being a mnemonic for the sins as written in Latin). Having now found their way to Massachusetts, they have attracted the attention of two strange cousins – Gerwulf Grimoire and the man known simply as Diesel. Each has abilities way beyond the ordinary, but lack the skill to be able to recognise one of these stones when they see it. Only two people in the world can do this: the singularly odd Hatchet, who teams up with the dark and dangerous Gerwulf, and cupcake baker Lizzie (newly moved to New England from New York), who finds herself assisting the impossibly handsome but off-limits Diesel and his mischievous monkey Carl. 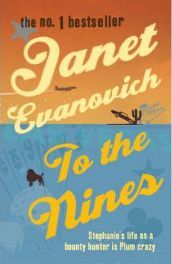 I had never read any books by Janet Evanovich and so I didn’t really know what to expect when I picked up ‘To the Nines’ to read. Nor had I realised that this book is just one of a whole host featuring the central character, Stephanie Plum. This did not matter in the least though, as To the Nines really works as a standalone story and I was not aware of any references to events in previous novels, although they were probably inadvertently there.